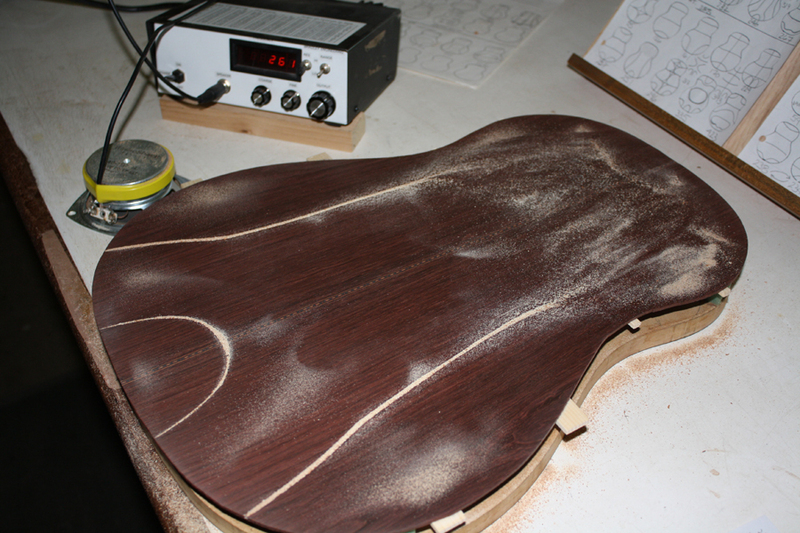 Randall Kramer has been building guitars for more than a decade. But he has been honing his woodworking skills throughout his life. As he put it, “I was fortunate as a child to have a mother who nurtured my need to build most of my own toys.” Today, the man known as Sparky to his friends is making much more sophisticated toys for the music-minded. His career as a designer and maker of furniture was enhanced by his earlier studies in engineering and architecture, and sources say Kramer is responsible for all of the best merchant counters, bars, and shelving found along the main strip of Truckee, California, the town he calls home. But Kramer’s other love was the guitar, which he has played since adolescence. Once he discovered the instruments of fellow Californian Mark Blanchard, he decided to learn the art for himself. In preparation for our review of the Schoenberg Quartet built by Randall Kramer, One Man’s Guitar put some questions to the luthier. 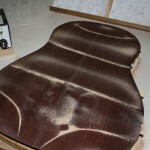 OM’s Guitar: So how did you move into guitar building? Kramer: I built my 1st guitar under the tutelage of Mark Blanchard, which included Chladni plate resonant frequency tuning. I owe him everything for the trajectory my building has been allowed to take. 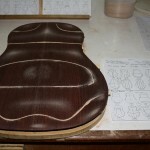 Prior to studying with Mark, I had a long career building custom furniture, so I brought a lot of woodworking knowledge to the guitar building table. 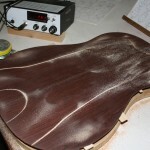 OM’s Guitar: How do you apply Chladni theory to practical luthiery? Kramer: My own building methods involve graduated top and back plates. All wood (and as far as I know, probably steel, aluminum, glass etc.) will resonate at certain frequency ranges in similar patterns. These patterns are predictable. Don Bradley [Bradley Engineering] builds a signal generator that has a dial for frequency ranges, a fine tune dial for the same, and an output dial which controls volume. A handheld 4″ speaker is held over the plate, which is supported on 4 small foam pyramids (to not dampen the resonances) and the generator is dialed through frequencies until the plate resonates. The fine tune dial finds the optimum resonant frequency. 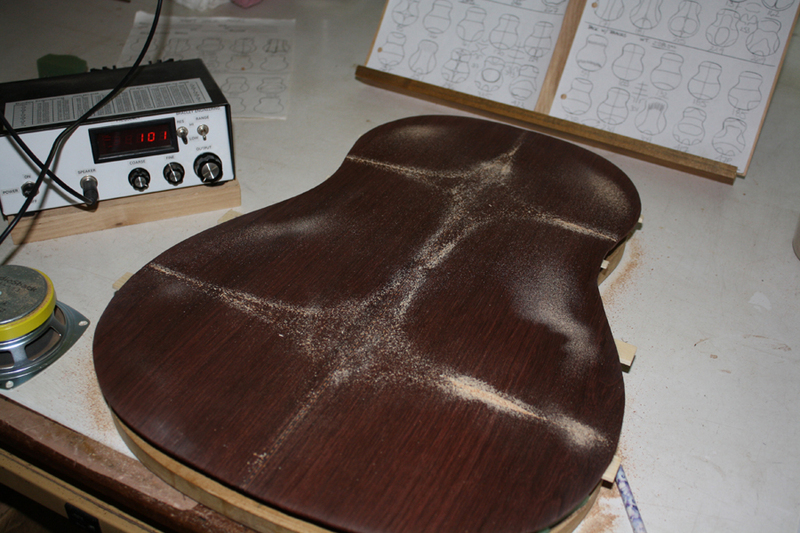 OM’s Guitar: You said you sprinkle sawdust on the “plate”, which then vibrates into the various patterns. 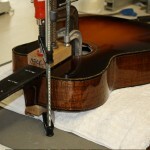 How does this help you build a better guitar? Kramer: These patterns and the frequencies at which they appear give precise information regarding long grain and cross grain plate stiffness and the relationship between them. A pattern is sketched and it’s frequency noted, and I move on to the next higher resonant frequency. I’ll record about 10 of these, evaluate the information contained therein, graduate my plate accordingly, check it again for resonant frequencies, and repeat the process until I’m satisfied with where I’m going. 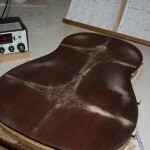 OM’s Guitar: This is before you apply any bracing? Before and after; braces are added and the process is repeated. After the top and back are attached to the sides, they are checked again, and any fine tuning done to the thickness of the plates or the height of the braces. This is more involved than I’ve described but this is it in a nutshell. My goal is to allow the plates to resonate at optimum efficiency throughout their frequency range so every note can reach its full potential. 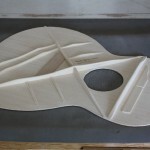 OM’s Guitar: The data gleaned from the process also influences bracing layout? 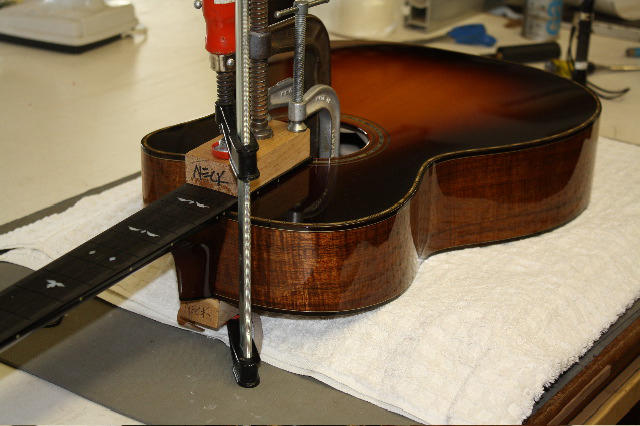 Kramer: I use a more or less standard X brace pattern, but will open or close the X, and move the tone bars and finger braces as I see fit. On occasion I’ve even run the tone bars directly across the body ala Larrivee, and even run them as an inverse fan. Both of these methods were to correct for a broad discrepancy in long grain vs. cross grain stiffness. I then use resonant frequencies to determine brace shaping. 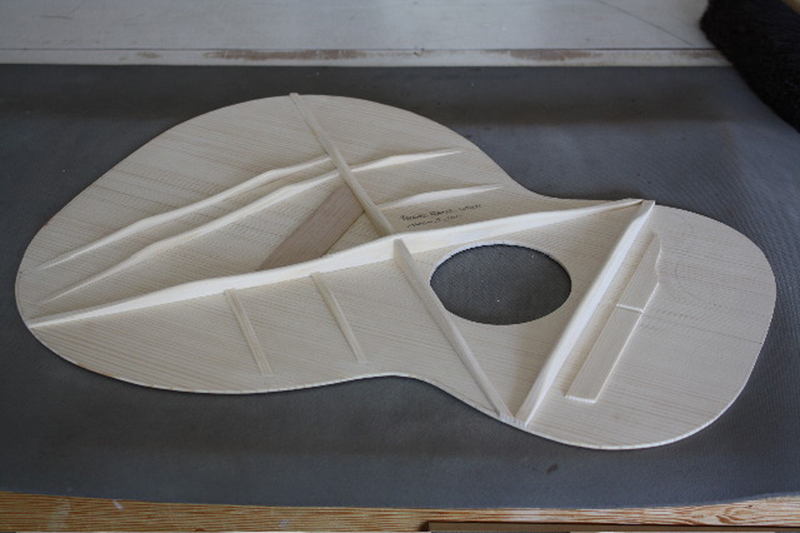 I keep meticulous records of the resonant frequency patterns, plate graduations, and bracing layout and dimensions, of every guitar I build. This allows me to evaluate each completed guitar and ask myself, why this, why that, and have a basis from which to tweak future builds. So my guitars, hopefully, improve incrementally from instrument to instrument. Or they can be moved a little here, a little there, to emphasize a particular player’s requests for tone. I constantly refer back to previous build records when beginning a new guitar. 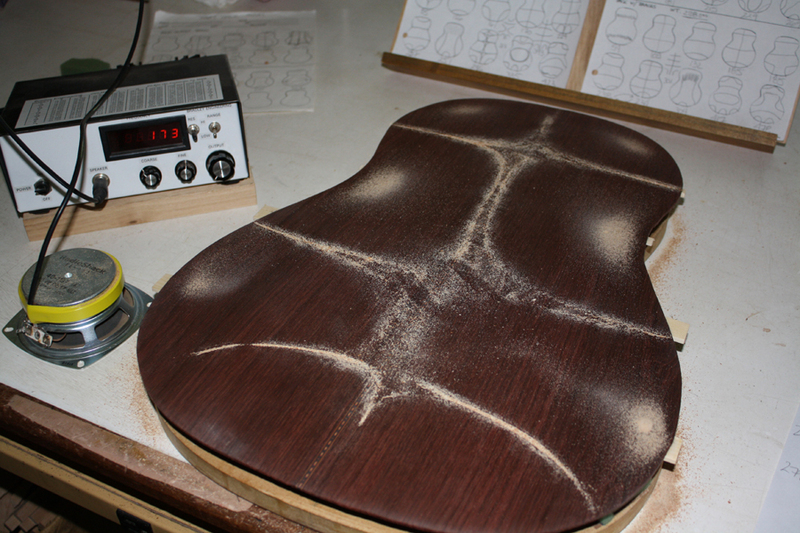 OM’s Guitar: You mentioned in an email that the Schoenberg Quartet has a 25′ top radius and 12′ back radius. 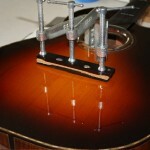 Do you use the same radius for all your guitars? Kramer: The radius remains the same throughout the model lines. Plate graduations vary according to initial plate stiffness. 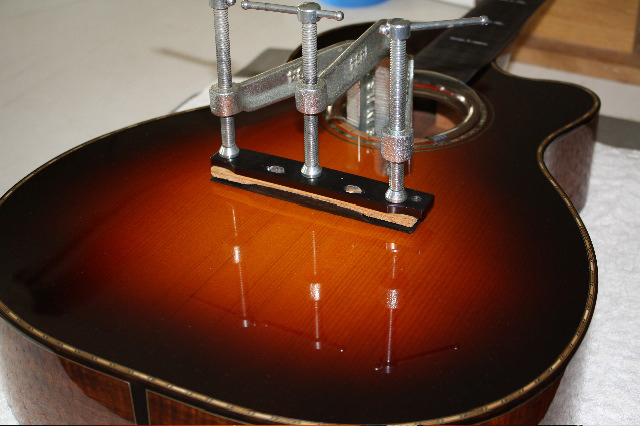 Also according to plate size; a larger guitar’s plate needs to span a longer distance and therefore needs to be a little stiffer. 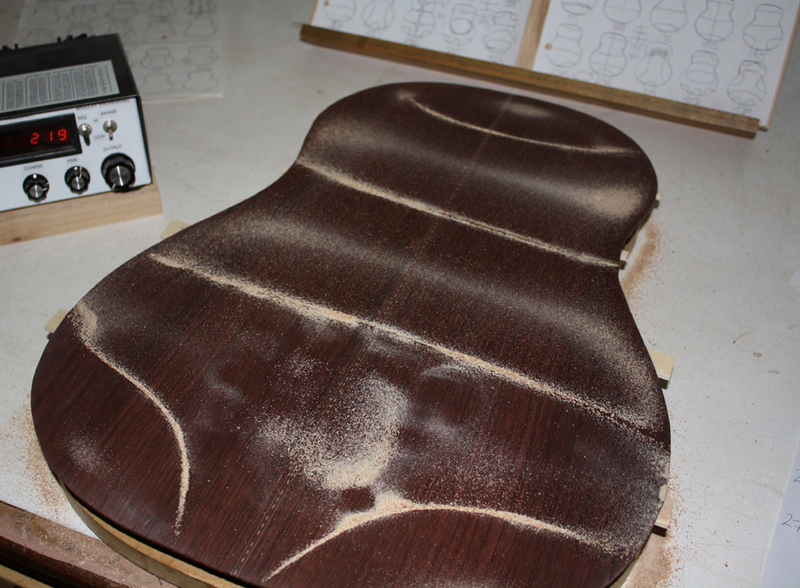 OM’s Guitar: How did you come to build for Schoenberg Guitars? Kramer: My first association with Eric Schoenberg was through “Luthiers Consortium”, a group of builders who show at the winter NAMM Show together. Following that, I began consigning instruments through his shop in Tiburon. So he was pretty familiar with my work when I approached him about building Dreadnaughts under his name, which was well established. After delivering the 1st D, named “Canon” by Eric, we discussed building a 12 fret D, and he had 2 early 30’s Martins in the shop owned by one of his clients, for me to take measurements from. So I did, but then the conversation circled around to designing and building a 12 fret 0000, or M, as Eric had for years discussed this concept with [Austin session guitarist and touring sideman] Stephan Bruton. From Martin specs for its 12 fret vs. 14 fret models, I extrapolated to come up with what this would look like. Eric approved, I built the 1st one, Eric tweaked the lines a little, and we had the Quartet. 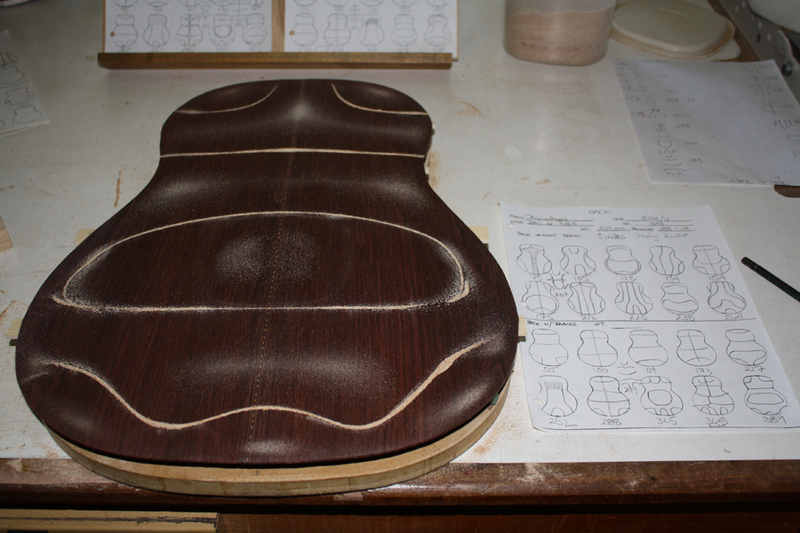 OM’s Guitar: What if anything are you doing differently when building for Schoenberg, compared to your own designs? Kramer: The difference between Kramer Guitars and Schoenberg Guitars, other than body shapes, which are exclusive to each, is nil. 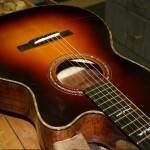 Schoenberg Guitars are notably Martin-esque. They were originated to recreate the 30’s Martins that Eric loves so well. 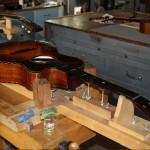 Prior to building Quartets for Eric, all of my guitars were taper braced. Eric insisted on scalloped bracing for the Quartet, so I’ve been experimenting, quite successfully, with incorporating them into my building style. I’ve always felt, and still do, that scalloped braces add to the bass response and detract from the treble response, so it’s a fine line I’m walking to have both. Now, I’m incorporating the advantages of scalloped bracing into my own instruments, as I’m incorporating all of my methods into Schoenberg’s. I feel very honored to have connected with Eric and have his constructive criticism of my work, and his suggestions and requests for changes to improve playability and voice. We should all have such a mentor. 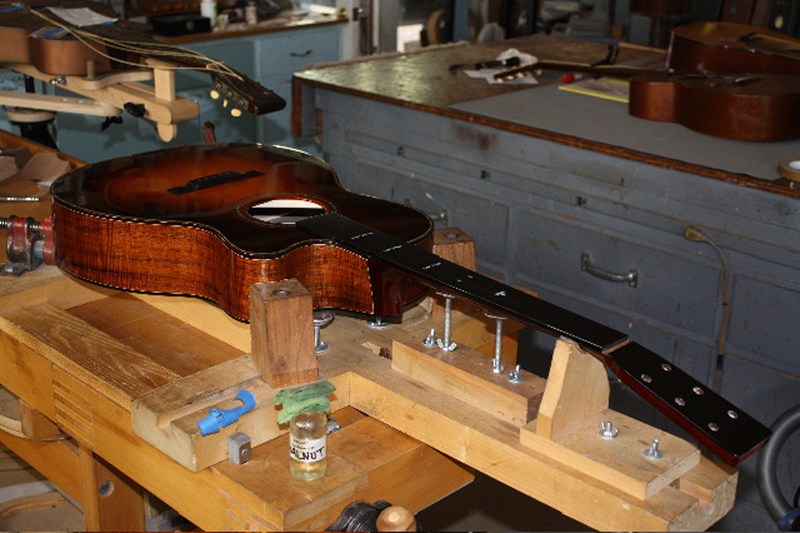 Randall Kramer will be showing some of his instruments at The Healdsburg Guitar Festival in August and The Woodstock Invitational Luthier Showcase in October. 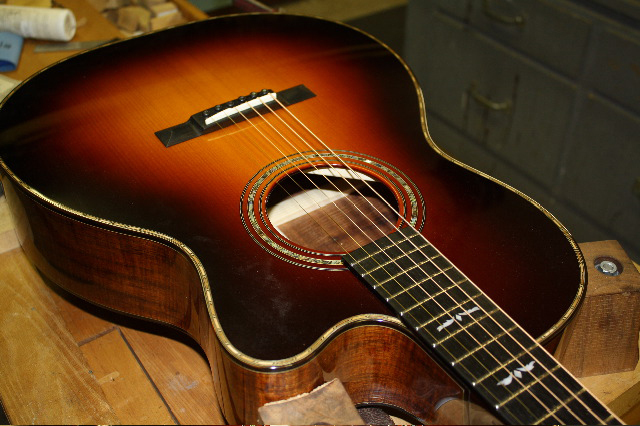 Kramer models appearing will include a Big Skye in Italian Spruce and Mango, a Great Basin Cutaway in Port Orford Cedar and Myrtlewood, and a Prairie Grass in Adirondack Spruce and Bois de Rose, an African Rosewood. That is very nice to hear, Bob. I will tell him you said as much. We are having dinner tomorrow night, during his trip to this end of the country. 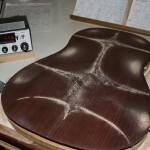 A great review of a great guitar and Luthier!!!! I own a guitar built by Randall and it is fantastic !!!!! Well than you very much, Dale. The Quartet is also fantastic. I hope to see more of his work this fall. We shall be seeing many others in the coming months.